Israeli naval commandos today raided a cargo ship that had reportedly left the Iranian port of Bandar Abbas destined for Sudan and seized dozens of advanced heavy rockets hidden in boxes covered by hundreds of sacks of cement. The Associated Press quoted an Israeli Defense Force spokesman that the rockets were to be ultimately delivered to Palestinian militant groups in Gaza. The rockets were M-302C, M-302D and M-302E with ranges of 100-130 miles (160-215 km), putting all of Israel in their range from Gaza. They were made in Syria. The IDF Intelligence sources were quoted by as saying that Iran’s Quds Force was behind the elaborate plan to ship the rockets by air from Damascus International Airport to Iran, presumably through Iraqi airspace, then taking them to Bandar Abbas. 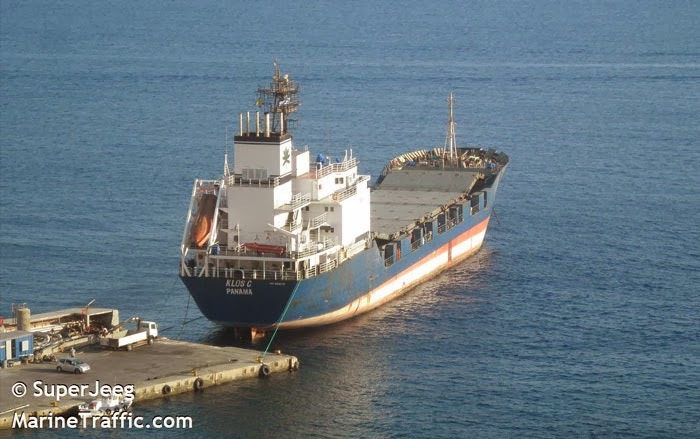 The ship, KLOS C (IMO: 8918710; MMSI: 373773000), is a general cargo vessel registered in Panama. The IDF says the ship left Bandar Abbas, made a stop at Iraqi port of Umm Qasr, where it loaded some more cargo containers, and then sailed toward Sudan. IDF says by stopping in Iraq, the Iranians were obscuring their tracks. IDF was reportedly following the weapons transfer for several months. 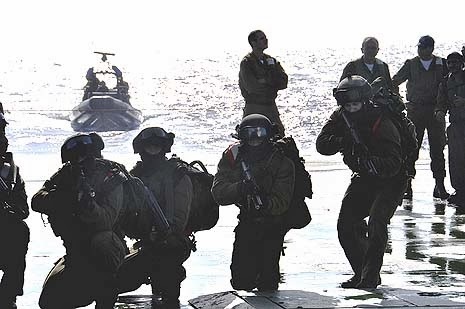 The ship was intercepted at 05:30 local time on Wednesday in the Red Sea by Shayetet 13, Israeli navy’s special forces, and along with its 17-man crew was taken to an Israeli port. Later today, the Israeli foreign ministry said that it will lodge a formal complaint with UN Security Council against Iran. If the Iranians were behind the shipment, they are in violation of UNSC resolutions 1747 and 1929, prohibiting arms exports from Iran, and they could be referred to a special Iran sanctions committee set up by UNSC under resolution 1737. UPDATE: The State Department spokeswoman Jen Psaki said on Wednesday that the U.S. military was prepared to get involved in the seizure of the cargo ship KLOS C. Psaki added, however, that Israel “ultimately chose to take the lead.” The U.S. and Israel worked together, Psaki said, to track the ship. 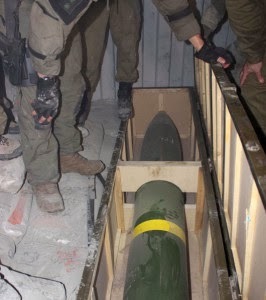 - A still photo grabbed from an IDF video showing sacks of cement allegedly used to hide the missiles. Why? If the ship was really at Bandar Abbas recently, which is easy to prove or refute as the movements of all cargo ships are recorded and made public by maritime monitoring organizations, it was there to load some cargo, and the ship’s manifest showed it had cement destined for Sudan. 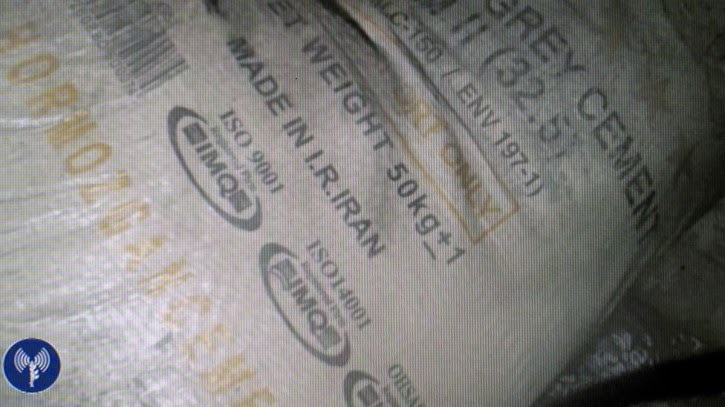 So naturally you should find cement sacks from Iran onboard the cargo ship. The question is if the vessel was also carrying illicit arms hidden under the cement. The ship's movement also shows a stop at an Iraqi port after Bandar Abbas. Again the movements of all cargo ships are recorded and are part of public records. If the arms were indeed onboard the ship, it is highly doubtful that the Iraqis were the ones who loaded them onto the ship. How did the Israelis know what the ship was carrying? They say they have been monitoring the whole process, beginning from Damascus, in the past few months. And the Americans are now saying they too, along with Israel, were tracking the weapons movement and were ready to intercept if Israel did not want to take the lead. This is becoming like a spy movie! The cement is made in Iran, The Rockets are ""Syrian" made 302mm Rockets. Why on earth would iran go to all the trouble to acquire and ship syrian rockets to gaza when it has its own very capable rockets that would work just as well,the whole thing has the same level of credibility as the saudi ambassador "assassination plot"
USKOWI -this is nobody's spy movie! !- but the epitome of US and Israeli hypocrisy.! how does Israeli and US arms get to reach the rebels in the DRC [CONGO] and the opposition in the south SUDAN? because the epitome of hypocrisy is when in one morning you tell the world that Iran's missiles are primitive,it is the Chinese who down the sentinel drone not Iranian experts,all of Iran's' military tools need an upgrade because they are world war 11 class!.- but next morning you 'intercept' military tools heading to the Gaza ,you start to to rise the status of the Iranian defense industry y saying the missiles are 'highly advanced Iranian made'!,a game changer,and that Iranian are not smart but we used a massive intelligence operation to intercept the cargo !. so democracy and goodness is when the US and co. sends arms to the rebels in syria, but EVIL is when a nation sends some defensive tools to the west bank! -THIS is the gospel , JUSTICE,according to the B.O.D!. What does Congo and South Sudan have anything to do with this story? And while you are at it, why don't you add a dozen more global issues to deflect the main story? Where did you read that the Iranian ballistic missiles are thought of as worthless? This blog has consistently covered the developments in Iranian missile industry and technology. Your rant on this subject is not understood, not by this blogger. This post was based on the reports published on this incident, including Iran's denial of it. You are saying that Iran was justified in sending these weapons to Gaza. You are then actually arguing with Iran which says the shipment never happened. Noted. We have received couple of angry comments about our coverage of KLOS C interception by Israeli commandos, using choice words that could not be published on this blog. Two points to their authors: (a) calm down! If you have a point to make, please do so in a civil manner. And (b) you are directing your anger at the wrong people. You probably are angry why Israeli commandos intercepted the vessel, and why the Iranians could not conceal the shipment, if the reports of weapons onboard of KLOS C were true. Redirect your anger (Israeli commandos and the Quds Force)! If it was a point made in those comments that needed to be answered, was the insistence that Iran would not send weapons to Gaza with “Made in Iran” markings on them. This is not what happened, however. The Israelis said from the beginning that the rockets were made in Syria. The authors probably mistake that with the sacks of cement made in Iran that were used to cover the boxes containing the missiles. The question was asked why were the missiles covered by Iranian-made cement sacks. Well, the ship had to show that it had Iranian cargo. Because KLOS C, the cargo ship that was intercepted, was at Bandar Abbas. Its presence there is public record, as ship movement monitoring agencies report the whereabouts of all ships. It was in Bandar Abbas to load Iranian cement; at least that was the cover story. If it did load the weapons, then the cement sacks were there to cover the real shipment in case if the ship was inspected somewhere. But of course those sacks of cement could not cover up the weapons if the Israelis knew in advance that the vessel’s real cargo were the rockets. Please resend your comments, without the use of the language pointed out above, and we’ll publish them, as always. Thanks. If there were weapons on board, it makes sense for the QF not to send Iranian-made missiles. Exports of Iranian arms violates the UNSC sanctions and also runs counter to the new push by foreign ministry to show that Iran is working to lessen tensions in the region. Again, if there were any weapons, then you should ask the QF, not this blogger, why they had to go through this to supply the Islamic Jihad or Hamas; didn't they have better ways? And I'll be interested to hear their answer.